pour off most of the water Repeat until the water that drains off runs almost clear. Transfer rice into a colander and let drain undisturbed for an hour. Transfer the rice to a rice cooker, add the water, cover and cook as directed by manufacturer’s directions. Bring rice vinegar to a boil in a small saucepan, and then remove from the heat. Stir in sugar and salt until dissolved. Allow to cool to room temperature. When rice is done, allow cooked rice to remain in rice cooker for 10 minutes. Transfer rice to a large shallow mixing bowl (traditionally a wooden tub, called a hangiri), so that rice forms a mound in the center of the bowl. Using a diagonal slicing motion, gently cut into rice with a wooden paddle (called a kijakushi), and pour cooled vinegar mixture over top of rice. “Cut” rice several times to evenly distribute vinegar mixture, then allow to cool. Gently turn rice over from time to time with paddle so that rice cools evenly. When rice has cooled to body temperature, it is ready to use for sushi rolls. Rice can be kept at the proper temperature by placing it in an insulated container such as a small ice chest, covered with a damp kitchen towel. In a medium-sized bowl, mix together the mayonnaise, chili sauce, chili oil, and masago. Add the minced tuna and stir to coat. Add chili powder to taste. Place 1 piece of toasted seaweed on top of a sushi roller (shiny side down). Wet fingers so rice doesn’t stick to your fingers. Press enough rice onto the seaweed to completely cover the seaweed, and press firmly so that rice adheres to seaweed. Turn seaweed over so that rice side now faces down. 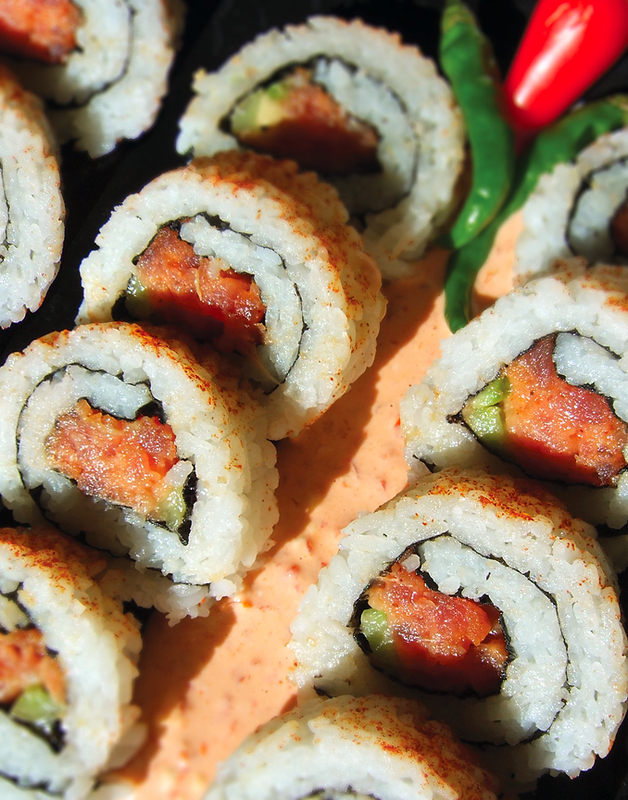 Arrange strips of tuna and filling on top of seaweed. Once the roll is completely rolled, reposition roll on sushi roller and press again. Sprinkle sesame seeds on a flat surface and lightly roll in seeds to coat. Allow roll to sit for a few seconds before slicing with a sharp, damp knife. In a small bowl combine mayonnaise, chile paste, hot chile oil, and sesame oil and stir to combine. Cut roll into 6 or 8 pieces and serve with dollops of sauce spooned on top, or alongside for dipping. Enter your email address to subscribe to nomnomTime and receive notifications of new posts by email.